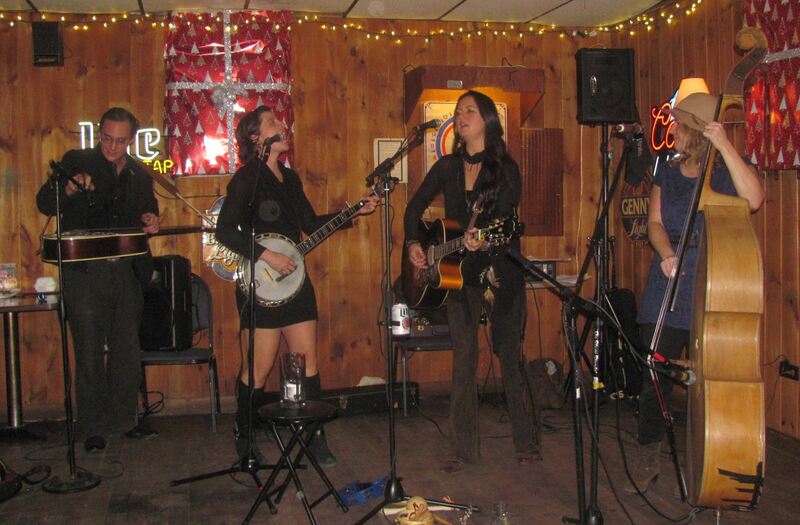 After Hours (from left) names proved themselves to an eclectic crowd at the Highway Inn on November 15. 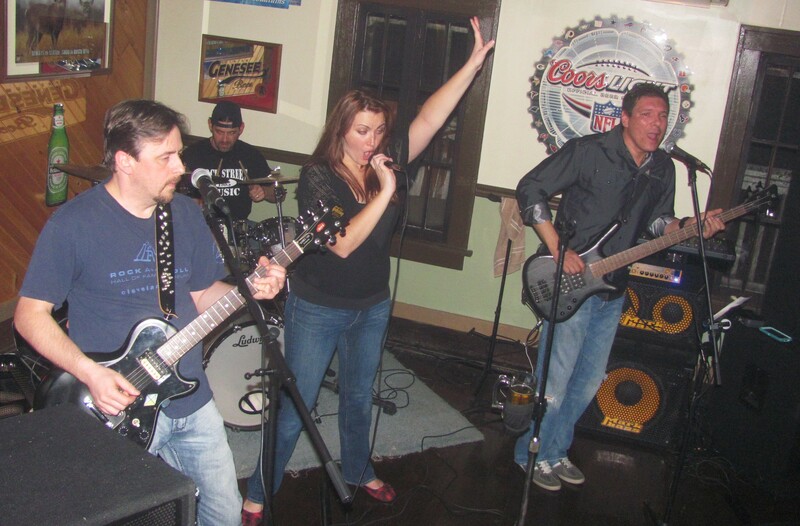 Former members of 12 Letters and Lipstyk Equal played some familiar favorites and other hits that kept the dance floor full from the second set to closing. Kicking off a night as a new band in a rural bar is never easy. Bartenders and musicians alike hold their collective breaths, hoping to strike a vibe with the existing crowd while also providing a “happening” backdrop for those likely to drift through out of curiosity during the first full hour. Attracting a sing-along crowd with the first set is often the best-case scenario for which a new band can hope. After Hours was not entirely new, however. The band represents a melding of 12 Letters and Lipstyk Equal, both ensembles previously offering fans renditions of hits crossing three decades or more that are heavy on percussion for dancing. 12 Letters played the Highway Inn and the Lovelton Hotel regularly for a few years. As a fan of 12 Letters for several years, I was sensing a stagnation among the five group members, primarily in their sense of adventure. I was curious about the first Wyoming County engagement of guitarists John Psolka and Bob Hyzenski with vocalist Kate Mangan and drummer Chris Bubblo from Liptsyk Equal, whom I’d never before seen. We actually thought we might miss their performance at the Highway Inn, as we expected to wrap the evening up on the other side of town. I’m glad we didn’t. Unknown to the band, the crowd seemed unusually eclectic – many recognizable patrons not hanging in their usual cliques. I was told, in fact, that the majority of us had all arrived within about 15 minutes of each and were merely finding our way through a very busy bar. But the music was well underway, the play list was immediately familiar, and a crowd that clearly needed to shake something loose was anxious to get the night rolling. Set 1 was chock full of songs that I recognized from 12 Letters old play list. The band started to stray some exciting new territory as the first set ended, but nobody was dancing. To me, the sound seemed to me to be too muddy. The somewhat surprising large early crowd was literally sucking up the beat. I might have overstepped my bounds, but I snagged John as he was leaving the stage area at the end of the first break. I suggested that they might get some dancers to the floor if they tightened up their ranges and tried to project the sound over the crowd rather than trying to ram it through them. John was so indulgent, and I hope that I didn’t ruin his break. We quickly collaborated and calibrated with the band’s awesome old-school equalizer. The sharper sound made the dance floor hop. Well, at least I know I hopped on to it. The changes in equalization also helped Kate’s vocals to soar and fill out her range. Without a doubt, After Hours struck a nerve with the crowd during the second set and pulled them into their zone. They owned the night from that point on. Meanwhile, bartender Erin Hunting was keeping up with guests, with some help from owner/manager Jerry Dente as the crowd reached its peak. Nobody was left wanting for a beverage. 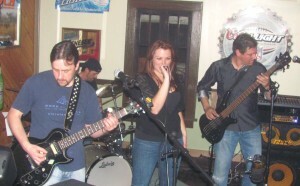 I am not sure how long they have been playing together, but the individual talents of After Hours members was evidence enough that more gigs and more practice will lead to an even smoother sound as they also become more familiar with the acoustics of bars in the region. I highly recommend After Hours, especially for venues that are known for routinely offering fresh sounds and new bands.